Santa Claus isn’t the only one bearing gifts from the north pole at this time of year. NASA’s Juno orbiter also delivered a sackful of presents over the holidays, but from the pole of a different planet: Jupiter. Every 53 days, the bus-sized spacecraft makes a close encounter with our solar system’s biggest planet, as part of a mission that was launched in 2011 and reached Jupiter in 2016. Juno’s main mission is to study Jupiter’s magnetic field and gravitational field, to give scientists a deeper understanding of the gas giant’s internal composition. But a visible-light camera called JunoCam was included on the probe, primarily to boost public outreach and education. 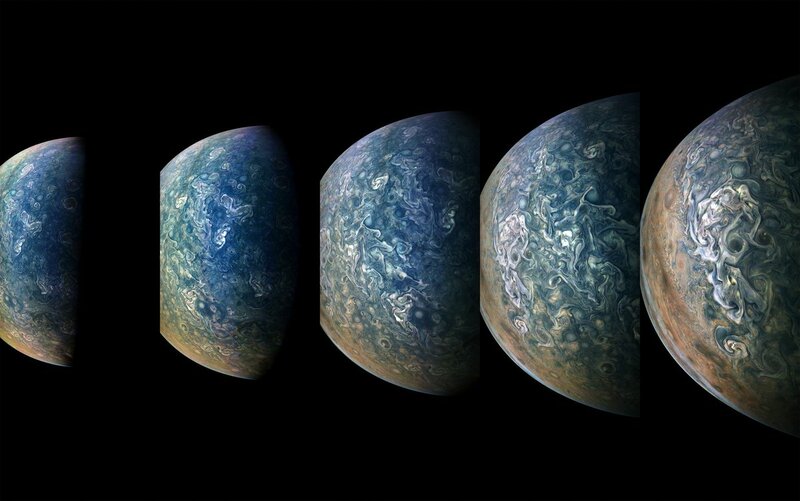 The latest encounter, known as Perijove 17, occurred on Dec. 21 and went over Jupiter’s north pole. This entry was posted in GeekWire and tagged Juno probe, Jupiter, Space. Bookmark the permalink.